Exposure to the elements can eventually cause the primary glazing seal of any window or door to develop small gaps that can allow water or moisture into the inner structure of the sash or panel. This can lead to water damage to the interior wood components and the insulated glass seal. Sun’s Water Management System provides two levels of protection against this problem. 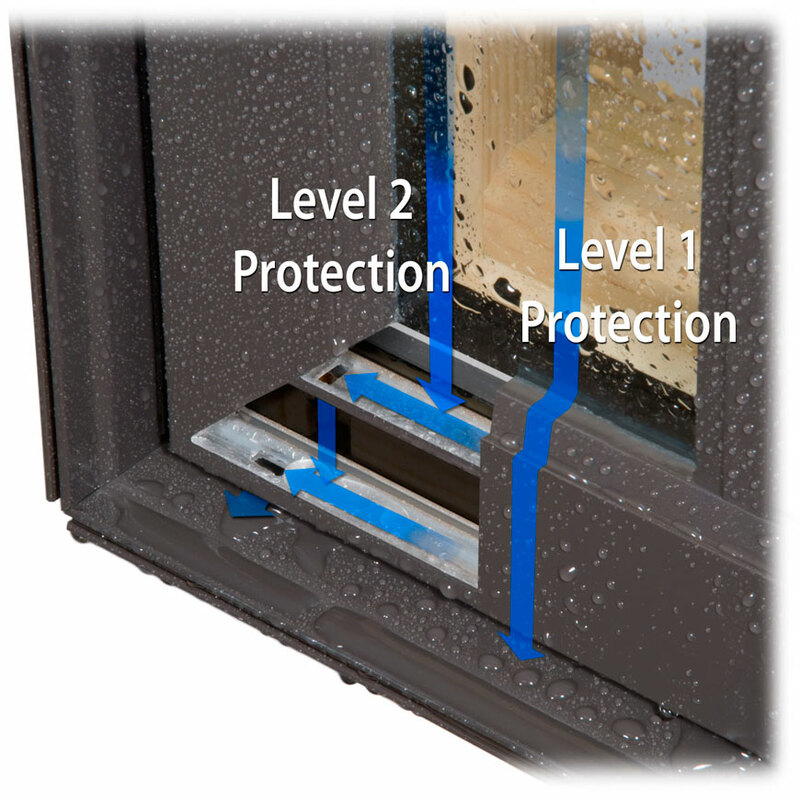 Almost all clad wood windows offer some form of Level 1 protection. Sun uses silicone to seal between the glass and the exterior glazing lip of the sash or panel. This seal is applied all the way around the perimeter and prevents water or moisture from seeping into the sash or panel. However, over time, this seal will likely fail due to the harsh effects of the weather. When this occurs, water or moisture will begin to enter the inner structure of the sash or panel, as well as the glazing channel. This will happen to any brand window or door. Once water begins to seep into the inner structure of the sash or panel, it can become trapped and cause deterioration of the wood components and the insulated glass seal. The design of Sun’s window sashes and door panels includes a system that provides a pathway for water or moisture to drain or vent out to the exterior of the unit. It also allows the inner structure of the sashes or panels to dry out. This prevents water or moisture from becoming trapped, protecting the insulated glass unit and the interior wood components.